This is my 2nd bicycle race of the year 2011. 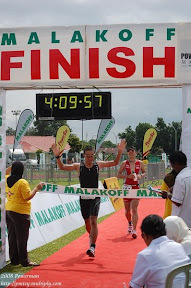 My first race was way back in January held in Subis, Miri Sarawak and the result was not that good. I was among the back finishers. For this race, it was a TEAM time trial event and it wasn’t hard for me to find another 4 cyclists to create a 5 man team. The usual members are Ali and Reza. One spot I offered to Ahmad Fathi but he decline the offer because at that race date, he was schedule to go overseas for work so I offered Keeran Janin since he was also looking for a team and we know he is fast. The last cyclist was Zaeidi. Luckily his team MIPR Spinners are not participating in the race, good for us. This time, the race was very well organized. They even invited one of the top Malaysian commissar to be the chief commissar. For checking the start and finish time, every cyclists were provided with a transponder to be fix to their left bicycle fork. The transponder was supplied by a Malaysian company – www.theraceboy.com and I guess their service fees were not cheap. Just look at the fine for every lost or stolen transponder – USD400, expensive lah. Everyone was given a 1 day UCI license to enable us to compete in this competition with other foreign teams. If it was only a local race, probably we won’t need the license. 3 Malaysian teams registered namely Malaysia National Team, Terengganu ProAsia Cycling Team and Piasau Peddlers from Miri and all of them did not go back home empty handed. Getting ready for the flag off. We were the 8th team with 2 minutes interval out of 18 teams. The last 3 teams are the elite teams – Malaysia Nation Team, Terengganu ProAsia and Brunei National Team A.
I’ll lead first followed with Zaeidi, Keeran, Reza and Aliuddin. This lovely photo was taken by Anakbrunei. Getting ready 5…4….3….2…1… GO !!!! GO Go go…….Before the first lane change over, I was already in attack mode. Zaeidi was behind me. Keeran was a bit surprise by the quick acceleration. Reza was supposed to be behind Keeran but I think he use the wrong gearing, making it a bit slow in accelerating. As a team, we did not manage to practice together not even once. So its difficult to judge everyone fitness and capabilities. Back to the race, I was leading the group at a speed of 38km/h up until the first bridge at Tungku Highway. I tried not to over do it by checking my breathing. If you breath erratically and you use both your mouth and nose, that means you’re overdoing it and that would kill you energy fast. Zaeidi then take the lead up until somewhere between Rimba and UBD then Keeran. After UBD, going out to the Tutong Highway, Ali takes over the lead and from there on, PROBLEMS. A few times we have to reduce speed because Keeran was falling behind. At one time near B.Shahbandar, our speed was below 30km/h because Keeran was still recovering from the Empire hill climb. As it is still early, we don’t want to leave him behind. Ali is still leading the group but maintaining the speed around 35-38. After Istana Jerudong, Keeran was once again cannot keep up with the speed. He told us just to go ahead and he will try to catch us later which he never did. At that time LOF Bakery B, team no 9 was already behind us and just about to overtake us. So when Keeran give us the go, We accelerated away leaving behind LOF Bakery B and Keeran. With LOF Bakery B, it was like playing cat and mouse. They managed to overtake us but a few kilometers later, we overtake them again. The whole process goes on a couple of times. I guess we managed to catch and overtake them was due to one of their cyclists was having problem keep up with the group speed. After the halfway point U-turn at Kg Penanjong, they drop their weaker rider and Zoom away and after that there was no chance in overtaking them. We managed to overtake 4 teams ( TJ Riders, G530 B, Legends & ‘OL’ Tutong Team) and in return 4 other teams managed to overtake us – 3 Elite Teams and LOF B. It was hot already when the race started (8:30am) but after the half way point, it started to rain. The cool shower really cool down the body but the rain didn’t last long. After a few kilometers, it stops. The journey back to the finishing line – it was still the same. Zaeidi is still doing more work than us since he is the strongest. Reza can no longer take the lead but he still can follow. So he is still good as we do not need to slow down. Every time there is a climb, we have to reduce speed because all 3 of us don’t have the energy to push hard climbing except for Zaeidi. On flat, we still managed to maintain speed of 40km/h and at one point we almost reach 50km/h. That was from Brunei Muara/Tutong Boundary Signage all the way to Istana Jerudong. In short, we managed to finish together as a team and with me clocking as the 4th rider – the official finisher. Group photo with the Guest of Honour – Pehin Yahya. The guy wearing black T-shirt is Keeran. He change his uniform. My brother, 2nd from left (next to Pehin Yahya), he was participating in the XPDC TelBru. We finished no 8th, the same number as our starting position. Before the race, looking at all the teams, I predicted that we would get 7th and Ali predicted for a 5th place. The 4 National teams, that is already unlikely to be unbeatable by us. G530 A – Aiman’s team is one of the strong local team and the other strong local team would be the ‘OL’ Tutong team. I didn’t expect the Piasau peddlers from Miri to be that strong. The rest of the local teams, some are virtually unknown capabilities (I didn’t know how strong they are), some are just average riders and some are just unbalanced team with strong and weak riders combine together. Luckily we only have 1 weak rider. If it is was 2 or more, then the answer would be ‘HANCUR’. Cruising mode lah all the way. Overall, it was a good race. I was having fun and my training really paid off. My team was well balance except for Keeran which we over estimate him. The race was very well organize and way much better than last year. Hopefully Telbru will keep up the good work in providing a good competitive race so that the racers are satisfied with management, race, route and the results. I guess everyone really enjoyed the race and Telbru should consider of doing it again next year. 18 teams – 90 cyclists including team managers and supports. If it is a road race, it wouldn’t be this many. Most would just watch by the sideline. Next year would be restructuring the team with changing the team members, new jerseys and maybe a new bike for me. And for Road Racer out there, rumors has it that there’s going to be a road race in Mid May 2011. Congratulations to everyone and keep on cycling………………………..